Pudding cups need to have effective oxygen barrier properties to guarantee the quality of its shelf life. This article introduces an oxygen transmission rate test method to test the pudding cup, i.e. the coulometric method. The test principle, instrument features, specifications, and testing procedures are all included in this article, which may provide reference for oxygen permeability test of packaging containers. Cup shaped containers are used to pack pudding products to keep the shape of pudding and avoid deformation caused in the transportation and storage process. Milk, eggs, and fruit juice are the main raw materials used to make pudding. These ingregients are liable to be oxidized, which in turn can cause the loss of nutrients, inferior taste, and deterioration. Therefore, these packages need high oxygen barrier charcteristics. Pudding cups are mainly made of glass and plastic. Plastic cups are widely used as they are easy to transport. There is a significant difference in the oxygen permeability rate between various plastic materials of pudding cups. Even for the same material, due to the differences in thickness and process technique, the oxygen permeability may be noticably different. Therefore, precise OTR readings for the cups are crucial for maintaining quality control. One type of plastic pudding cups was tested for its oxygen transmission rate. There are two main test methods of oxygen transmission rate of packaging materials, i.e. differential pressure method and coulometric method (equal pressure method). The tests mentioned in this article were performed according to ASTM F1307-02: Standard Test Method for Oxygen Transmission Rate through Dry Packages Using a Coulometric Sensor. The testing instrument used in the tests mentioned in this article was C230H Oxygen Transmission Rate Test System, manufactured by Labthink Instruments Co. Ltd. The testing process can be divided into two parts i.e. permeation process and detection process. Oxygen and nitrogen with same pressure are injected into the space on the two sides of the clamped specimen. Due to the concentration difference, the oxygen permeates through the specimen to the nitrogen side. The coulometric sensor generates an electrical signal as the oxygen concentration increases by which the OTR can be calculated by the system. The test range for film/sheeting is 0.01 ~ 200 cm3/m2/day. The test range for package is 0.00005 ~ 1 cm3/pkg/day, with the resolution of 0.001 cm3/m2/day. The repeatability is 0.01 cm3/m2/day or 2%. The internal temperature and humidity of the instrument are automatically adjusted with temperature and humidity sensors, maintaining the stability of the test specimen environment. The test temperature range is (10±0.2)℃ ~ (55±0.2)℃. The test humidity range is 0%RH, (5±1) %RH~ (90±1)%RH and 100%RH. Three identical or distinct specimens can be tested simultaneously. The specimen size is 108 mm × 108 mm. The test area is 50 cm2. Unique DataShieldTM system (optional), meets the requirements for centralized management of user data. It supports a variety of formats of exported data. Reliable security algorithms are used to prevent data leakage. It supports universal wired and wireless LAN, optional private wireless network, and supports third-party software. The instrument is applicable to determining the OTR of various plastic films, paper, plastic composite films, co-extruded films, aluminum coated films, aluminum plastic composite films, sheeting of PP, PVC, PVDC, metal sheet, rubber sheet, silicon wafers, wine bottles, bottles, peanut oil bucket, tetra pak, vacuum packaging bag, three-piece metal can, plastic cosmetic package, toothpaste tubes, jelly cups, and yogurt cups. The instrument can also be used to test the oxygen barrier property of sealing lid, solar panel sheet, pipes, medical blister pack, automotive fuel tanks, and battery shell, etc. The instrument conforms to various Chinese and international standards such as GB/T 19789, GB/T 31354, ASTM D3985, ASTM F1307, ASTM F1927, DIN 53380-3, JIS K7126-2-B and YBB 00082003. (1) Seal the specimen in the fixture for package test with rapid adhesive. Next, wait until the adhesives get solidified. Install the fixture with specimen on the instrument and seal it with a sealing bag. There is a package hood that controls the temperature. (2) Set specimen name, test temperature, humidity and other test parameters. Click Start Test to start the test. (3)The instrument automatically controls temperature and humidity. The test is performed automatically. Test results are displayed after tests. In this test, the oxygen transmission rate of the test specimen was 0.56315 cm3/pkg/day. The oxygen permeability represents the oxygen barrier property of a pudding cup. Pudding cups need to have an effective oxygen barrier property to guarantee the quality of the product’s shelf life. This article introduced an OTR test of a pudding cup using the coulometric method (equal pressure method). Labthink Instruments Co. Ltd. is a testing technology company focused on material research along with manufacturing of packaging testing instruments and commercial testing services. 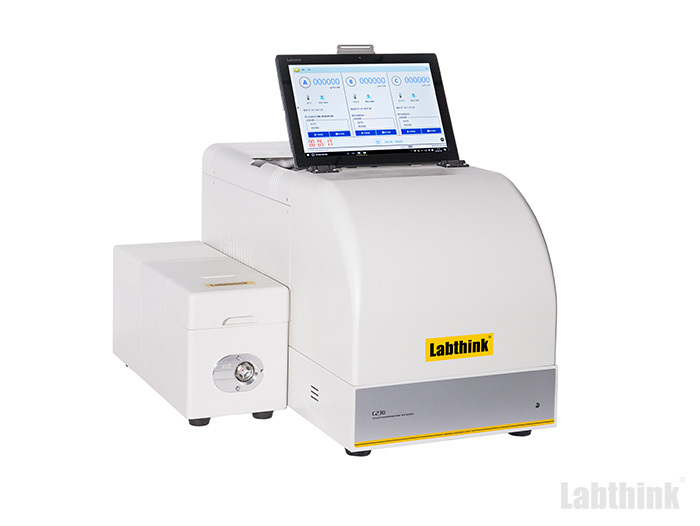 Labthink’s instruments are widely applied in industries such as food packaging, pharmaceuticals, household chemicals, packaging materials, printing, automotive, electronics, third-party testing organizations, and academic institutions.